FinTech + Politics = ? For a long time we have shared our manifold and increasing concerns about Germany’s financial/banking system with all who would listen and also quite a few who would not. Concerns range from excessive costs, low interest rates, high fragmentation, too many branches, too many deposits, suboptimal governance structures, questionable business models etc. The final nail for financial Germany’s coffin could well be FinTech. German institutions have long ignored the challenge of digitalization (nowadays also called digitization). As late as 2015 only some German financial institutions seem to have received their FinTech wake up call. German banks are still in the early stages of our disruption cycle. In addition, we cannot spare politicians and regulators from our growing concerns. To our knowledge, there is literally no serious FinTech initiative in Germany led by politicians, federal representatives or financial watch dogs. And the UK is already successful in luring foreign FinTech companies. Two of Germany’s most prominent and best funded FinTech startups SumUp and Payleven are already regulated by the FCA and have moved a part of their operations to London. German Bitcoin company SatoshiPay has recently emigrated to London following its peer Yacuna. German challenger bank Fidor has recently started its service in the UK. Finally, German P2P-Lender Zencap has been acquired by its UK counterpart Funding Circle. Even Australian FinTech companies Lend2Fund has decided to move its operations to London. US startup stockfuse has been lured into Barclays‘ London based accelerator programme (powered by) Techstars. 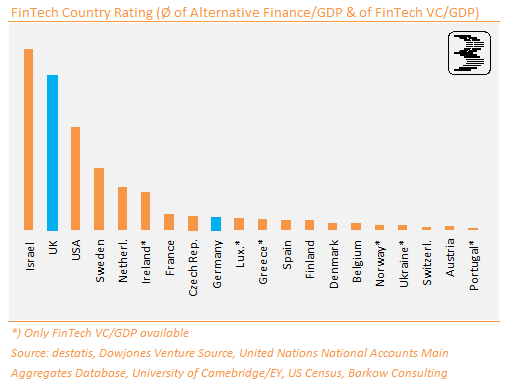 At the same time private FinTech initiatives are mushrooming in Germany. We count 15 conferences, pitch days, hackathons etc. with a focus on FinTech in the last quarter of 2015 alone. It might be time for German politicians to follow suit!